Campus Book Rentals Giveaway | A Savings WOW! 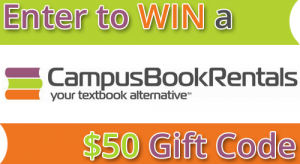 Grand Prize: A $50 Campus Book Rentals gift code for you and one to give to a friend! Renting textbooks can save you a lot of money, and is a far superior alternative to buying your books. You can rent your textbooks without the risk of your books becoming devalued by the end of the semester and of course, you can easily rent them online. Over 1 million customers rent textbooks from them at over 5,500 college campuses across the nation. Join the movement, pay less for your college books, and save your hard-earned money. – They have an excellent support staff and we’re always only a phone call away. – They’re one of the pioneers of the textbook rental movement. The textbook rental movement happened in the summer of 2007, and originally there were only three companies. We were one of the originals. – You save a lot of money when you rent textbooks. And if you want to keep your books at the end of the semester, just pay them the difference and the books are all yours. – If for any reason you change your mind about your book(s), you have 30 days to return them for a full refund. – RentBack.com, which is their new initiative that allows students to rent the textbooks they own – to other students. This is awesome because it makes them 2-4x more money compared to what they’d make through buyback options!